Is the WikiLeaks founder, who until Thursday had been holed up in the Ecuadoran Embassy in London for years, essentially a publisher — though a notably strange one — who believes in taking radical steps to expose government secrets, and who thus should be afforded the same First Amendment protections given to news organizations? Or is he a reckless traitor — and by no means a journalist — who deserves no such consideration and who should be prosecuted without worrying about free-press concerns. Assange is being charged under the Computer Fraud and Abuse Act, with the government saying that he conspired with former U.S. Army intelligence analyst Chelsea Manning — and that he helped Manning crack a classified Defense Department password. He is not, notably, being charged under the Espionage Act, which has been used in recent years to go after journalists and their sources. Manning was imprisoned for seven years, in part for being found guilty of violating that act. There's a substantial gray area here. And a troubling one. The question hinges on this: Did Assange cross a crucial line by allegedly encouraging the password hack — a line that no legitimate journalist would, or should, cross? Assange's attorney certainly doesn't think so. The charges, Barry Pollack said, "boil down to encouraging a source to provide him information and taking efforts to protect the identity of that source." And some journalists were quick to agree. The prominent First Amendment lawyer Floyd Abrams said Thursday that he hadn't made up his mind fully on the case but that one thing relieved him. The indictment is narrow in scope, not based on what journalists do all the time: receive and publish classified information, he told CNN. What Assange is accused of — breaking into secure government computers — "is fortunately not commonplace journalistic conduct." Those practices, he told me, are not only routine and lawful, "they're best practices for journalists." 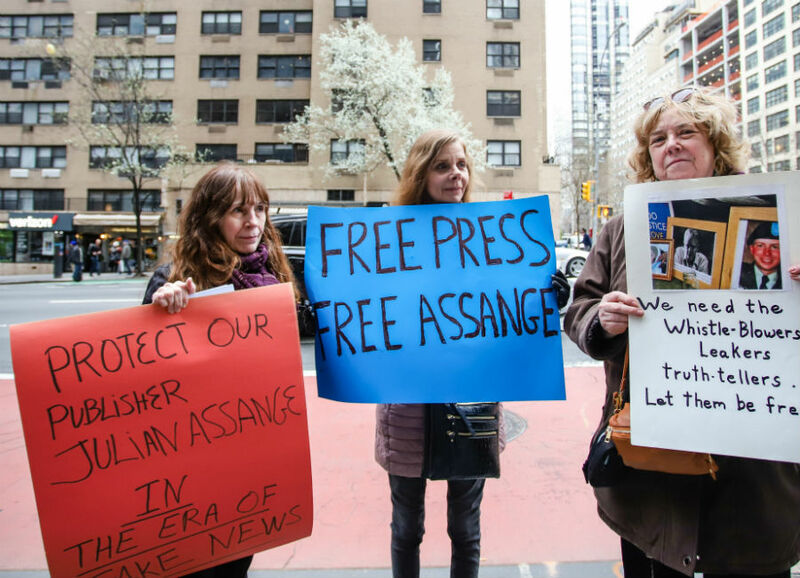 In fact, WikiLeaks and Assange — and certainly Edward Snowden's 2013 leak of vast amounts of government information, bringing widespread government surveillance to light — have helped to usher in a new era for journalists. News organizations now provide secure drop boxes for sources. They wisely use encryption applications such as Signal to converse with, and receive information from, sources. That these practices are cast as part of the conspiracy "should worry all journalists, whether or not Assange himself is seen as a journalist," Peters said. What is distinct, though, is the conspiracy to break the password on a secure network. That Assange is such a strange and, to many, unsympathetic character may enter too much into the debate. He's hard to defend. "When governments are trying to restrict press rights of any kind, the inclination is not to go after the most popular kid in the room — it's to go after the least popular," Trevor Timm, executive director of the Freedom of the Press Foundation, told me last year. What WikiLeaks has consistently done, Timm said, "is publish information that is true and that the government considers secret." Recall the Pentagon Papers, the secret history of the Vietnam War, which Daniel Ellsberg nearly 50 years ago stole from the Pentagon and delivered to The New York Times and The Washington Post. Even before the attempt to crack the password, Manning had given WikiLeaks hundreds of thousands of classified records, prosecutors said. The material allegedly included four nearly complete databases, comprising 90,000 reports from the Afghanistan war, 400,000 reports from the Iraq War and 250,000 State Department cables, The Post reported Thursday. The American Civil Liberties Union's director, Ben Wizner, remains firmly in Assange's corner. Prosecuting him "would be unprecedented and unconstitutional and would open the door to criminal investigations of other news organizations." Yes, Assange crossed a line if he indeed conspired with his source to break a secure government password. But the risks to news organizations of prosecuting him remain very real. Before we turn our backs on Assange, we ought to think deeply about what's at stake. Casting him to the wolves as nothing but a narcissistic bad actor — "not like us," of course — may seem tempting. But organizations that aren't so very different in their aims may suffer the consequences.